Our research group, in one slide. We work jointly with several international networks of researchers, clinicians, patients and industry that collaborate to find new treatments for neuromuscular disorders. 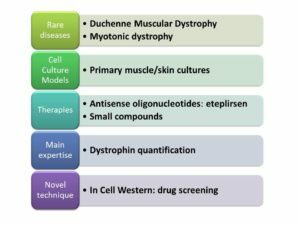 Our group works in the optimisation of preclinical drug testing in DMD and we have developed new methods to evaluate these therapies using low numbers of cells. Also, we use new CRISPR/Cas gene editing techniques not just as a new potential therapy, but also as a tool to generate better cell culture models to be able to evaluate new treatments more thoroughly before going into clinical trials. We work with human as well as animal cell cultures, so we may collaborate in accelerating the transit to clinical trials as well as minimising the number of animal experiments.